Usefulness – Being useful is fundamentally about being a valued member of a team who is visibly contributing to generating outcomes, enhancing the team in noticeable ways, and is missed when absent. If we aren’t proving to be useful, either we are on the wrong team or we have the wrong skills. Not being useful to one team does not mean we aren’t of use to other teams. There are countless examples of athletes who proved to be less than useful to one team and yet flourished on another. Life is about human connection and it’s all but impossible to connect with people who don’t find you useful or believe you are adding value. It’s important to me to both feel useful and be seen as useful wherever I am. When I contemplate my next adventure, I want to have a positive visible impact on the team and each individual on it. Reliability – Because it is so infrequent these days, I find that I am drawn toward people who actually do what they say they are going to do. I am also pleased when others see that I am in fact one of those people. Too many people show up to meetings late, miss deadlines, and don’t follow through on the ‘promises’ they make. In a tactical sense the military is very good about those things, but when it comes to strategic initiatives the lack of follow-through has become the standard. I pride myself on being part of a team where I am confident that the person to my left and right are going to do their part and I am committed to giving others every reason to have the trust and confidence in me to do the same. Teammates who aren’t reliable aren’t really teammates. And teams with unreliable individuals aren’t teams to which I want to belong. Integrity – I’ve grown accustomed to being surrounded by people with great integrity. It’s part of what draws us to serve in the military, it’s required of those working in the intelligence community, and it’s core to how we are developed from day one. Though we read about the exceptions in the press, generally speaking we in the military do the right thing, exhibit strong morals, and are extremely honest. Having seen so much right in this world, the anomalies stand out. Seeing wrong makes me sick to my stomach and I have refused to look the other way when I see it. Being perceived as not doing the right thing, or personally assessing that I have done something that could be perceived as dishonorable, crushes me. I cannot tolerate a lack of integrity on the part of those in my circle. As I leave the Navy, which is so committed to upholding high standards of integrity, I am doing my best to ensure the team I join shares such a commitment. Humility – In my opinion, the single greatest character flaw is arrogance. I value those who are modest, humble, refuse to take themselves too seriously, and spend time elevating others. In an effort to ensure others know that I am not the center of my universe, I have been guilty of being a little too self-deprecating at times. That’s something I will focus on a bit more. As I contemplate the next team I will join, I want to solve important problems alongside confident, humble, team players: People who acknowledge the role luck plays in our lives and are grateful for the opportunity to do good in this world. Joy – I struggled with using this particular word as a personal value. To me, joy is happiness, pleasure, and smiles. We are reminded with great frequency that life is short. To the maximum extent possible we ought to be bringing joy to it. It’s difficult to bring joy to others if we aren’t joyful ourselves. There have been times in my life when joy wasn’t prevalent and I remain grateful to people and circumstances that helped me turn the corner. I have seen enough of the non-joyful to appreciate how important joy is and should be. I want to work in an environment where fun, fulfillment, happiness, and positivity are prevalent. I want to help make any environment I join enjoy even more of each. There are many things in life I value, but when asked to distill it into my top five this is what I came up with. The Navy has ensured that honor, courage, and commitment are core to who I am. I am grateful for that. My family and friends are well aligned with the values I shared above and I will do my best to ensure the team I choose to join affords every opportunity to remain centered within these values. 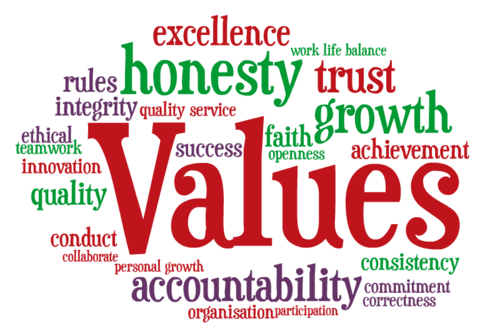 Are your values driving your behavior? How aligned are your teammates with those values?